Starbucks Via: So 20th century! I will admit it. I’m an instant coffee drinker. I know I’m not the only one in America, but I’m one of the few who will admit to it. I drink instant coffee because it’s easy to make, but also because I like my coffee fairly mild. I do have a strong preference for Taster’s Choice and Nescafé – so I do have some standards of sorts, but clearly they are not very high. 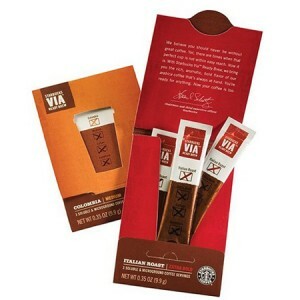 I first heard of Starbucks VIA last May when I won a raffle for a Starbucks gift card and the card came with a 3 individual samples of French Roast instant coffee. I tried them and they were great. The coffee has a rich flavor, stronger and more developed than any instant coffee I drink, but without the bitterness of the real thing. As far as instant coffees go, it’s by far my favorite. But… it’s expensive. Ridiculously expensive, about 83-cents per cup, though if you buy it bulk you can get it down to 60-cents a cup. A cup of Taster’s Choice costs less than 10-cents by comparison. So needless to say, I haven’t been buying it. Soon after I received my sample pack, I saw VIA at Safeway, and not too long after that, at Grocery Outlet. But even at Grocery Outlet it was too expensive, though I don’t remember exactly what the price was. Today I noticed that the 3-cup packages are down to 99-cents (though they expired in June). 33-cents a cup is not too bad, so I bought a few packages to have it as the occasional treat. Lately, I’m drinking tea anyway. The biggest problem with VIA, besides the price, is all the needless packaging. I guess they need it to make you think you are getting more from your money than you really are. It’s unlikely that anyone seeing a $40 7-oz jar of VIA placed next to a $10 jar of Taster Choice would reach towards the former. But all of this means a lot of wasted materials which come at a significant environmental cost. I’m sure that Starbucks did a lot of market research before introducing this product, but I just don’t see who it would appeal to. Mr. Bagel is no more. Four Seasons Cafe & Deli has taken over the space. Mr. Bagel is the cafe that replaced Planet Coffee on East 14th in downtown San Leandro. The small cafe offers all sorts of coffee drinks, as well as lots of bagels and bagel sandwiches, some pastries and cookies and a full menu of hot and cold sandwiches ($5 to $7). Best of all they have Vietnamese sandwiches as well. My friend got one a while back and it was very yummy. In the last few weeks Mr. Bagel has become my “to go” cafe in San Leandro when I want to have a private talk with someone. I love Zocalo, of course, but it’s impossible to go there and not run into a friend or acquaintance and have an uninterrupted conversation with any one person. Mr. Bagel, fortunately or unfortunately, it’s pretty much empty all the time so it’s a great place to meet. It’s also quite comfy, their coffee drinks are great (I liked their caramel latte more than Zocalo’s zahlua) and the people who run it could not be nicer. It’s really a gem of a cafe, and I really wish more people would stop by. I still have to try their sandwiches – and bagels! -, I’ll make a point of it next time I visit.